The Fillmore: Since 1300 and Yoshi's arrived in a blaze of glory last fall, the Fillmore has, interestingly, seen far more shutterings than openings, but in all likelihood, Bruno's will be the next newbie on the Fillmore strip. 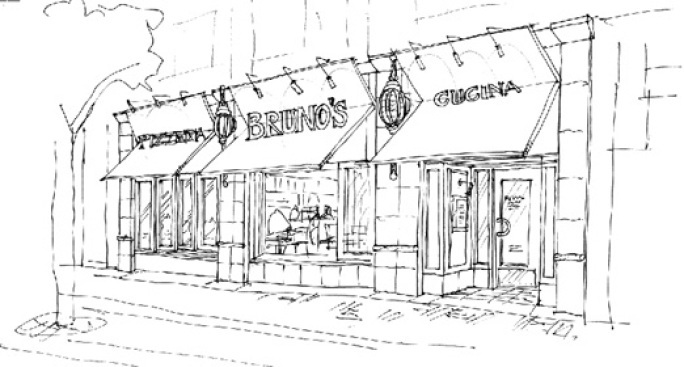 From the looks of the rendering above, our world famous chef's focus may have shifted from the original "pizza, pasta, salads and entrees" concept to a more refined moniker of "Pizzeria and Cucina." When in doubt in San Francisco, always add the "pizzeria" tag (backup panic plan, btw: communal tables). Anyway, the space—right across from Yoshi's—is being designed by Axis Architects, who have also done MoMo's and Fior d'Italia, among others.